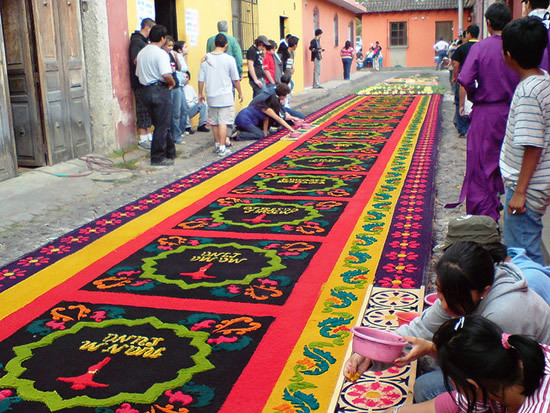 The creation of alfombras begins on the last Sunday before Easter, when the bumpy cobblestone streets of the old Guatemalan city are covered with a layer of leveled sand, to create a nice plane base for the carpets. Then, the sawdust goes through a screen, to keep any rough pieces from ruining the intricate patterns, and richly colored dyes are added. 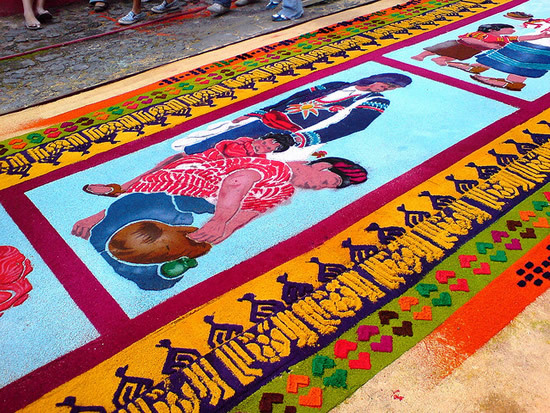 Once the colored sawdust is ready, people start creating the beautiful alfombras by spreading it over the layer of sand, adding various designs inspired by Mayan tradition, Christian religion and nature, using carefully-carved wooden stencils. 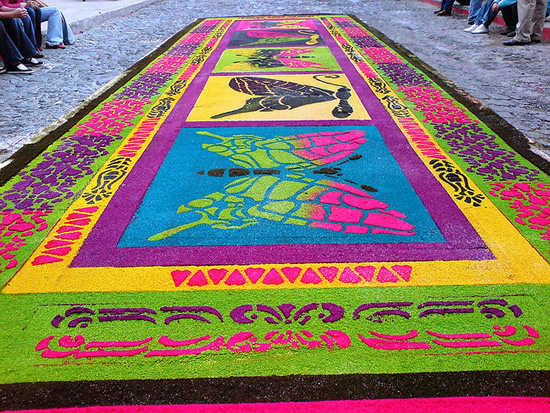 Some of these stencils are passed on from generation to generation, but new ones are created every year, so the design of the alfombras is always unique. 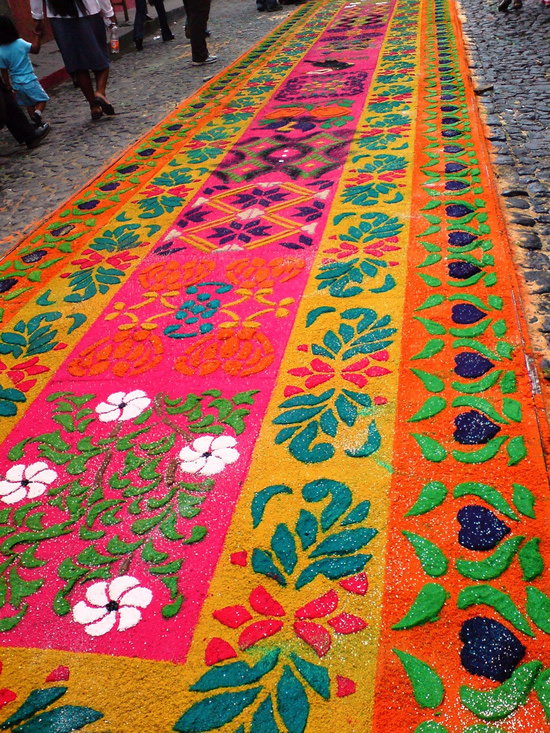 There are no rules to creating a colorful street carpet in Antigua; some people just drop some pine needles, flowers and vegetables over the colored sawdust, while others spend hours creating intricate patterns for their carpets. To make sure the wind doesn’t ruin all their hard work, the people of Antigua constantly use watering cans to keep the sawdust wet and compacted. The volume of work that goes into these intricate works of art is beyond impressive, considering a lot of them span over several blocks, and some are even a mile long. 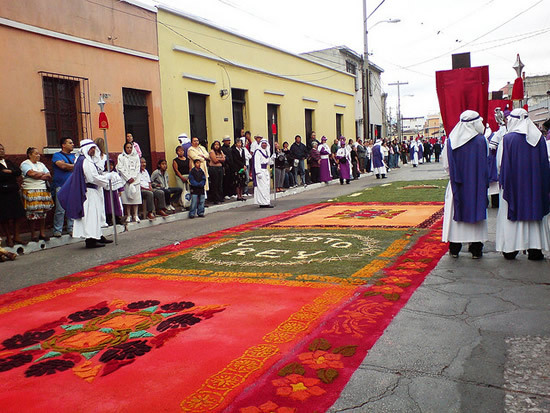 In Antigua, people create alfombras throughout Holy Week, but the most beautiful are created on Thursday night, hours before Good Friday. 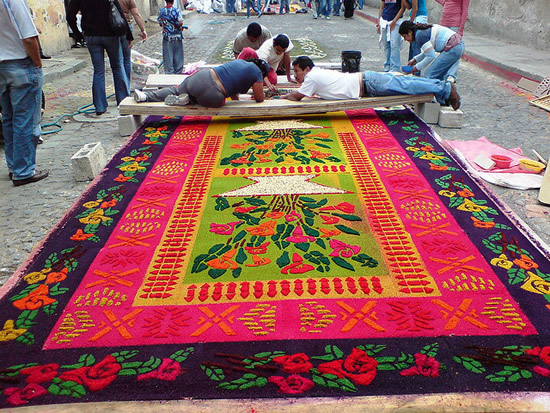 Many locals race through night to make sure their colorful carpets are ready before the big procession is carried out early in the morning. They are all a feast for the eyes, and it’s hard to believe all these people work only to see their masterpieces ruined under the feet of others, as the procession comes through. 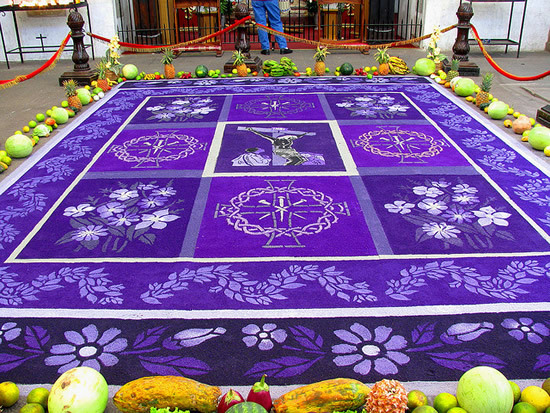 It seems almost unfortunate to see all those beautiful alfombras destroyed, but the art of carpet making in Antigua is sacrificial in nature. 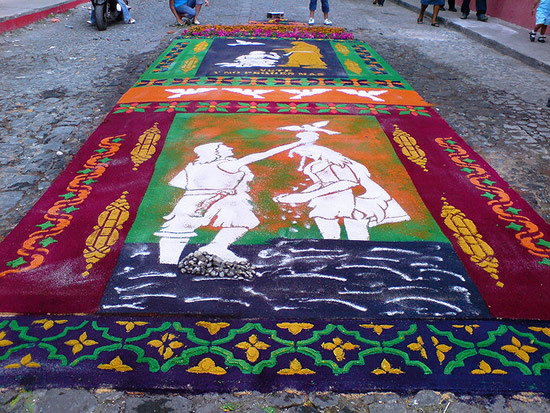 Just like Jesus Christ sacrificed himself for mankind, so the people dedicate themselves to making these beautiful street carpets only to see them destroyed. 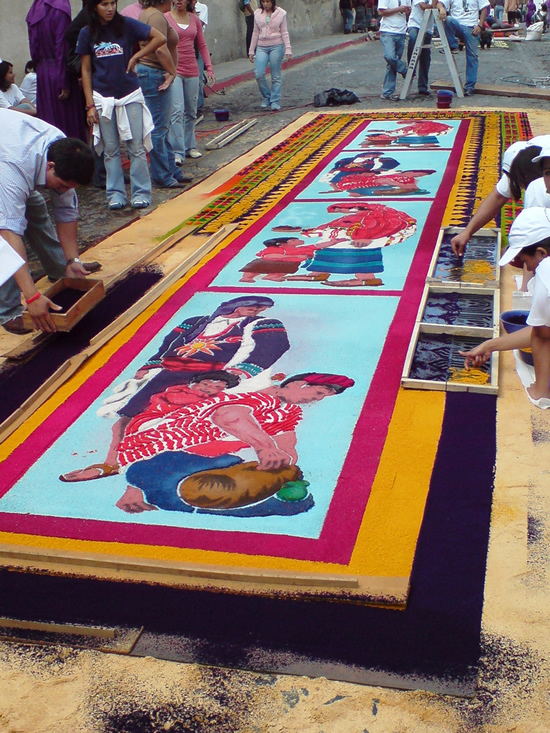 As soon as the procession passes the alfombras, the cleaning team is right behind them clearing the sand and sawdust and leaving just a few speckles of sawdust of what were once unique works of art.